Our Event Planning Specialists along with the attention to detail and effectiveness of our partners, will ensure that your next event is memorable and a complete success. From Board of Directors meetings to gala events, conventions, presentations, product launches, workshops, press conferences, cocktail parties, social and corporate events, our experts will help your event succeed. If requested, we can provide a list of recommended vendors for all your event needs such as: video projectors, laser pointers, sound systems, microphones, video cameras, VCRs, computers, printers, and wireless high-speed Internet. Our meetings and events specialists will be happy to assist you with music, food menus, floral arrangements or any type of entertainment you may need for your event. We know events can be stressful. If your event guests are staying at Real del Bosque Hotel, they are welcome to use the amenities. They may wish to play a round of golf, book a relaxing massage or a enjoy a rejuvenating spa treatment. 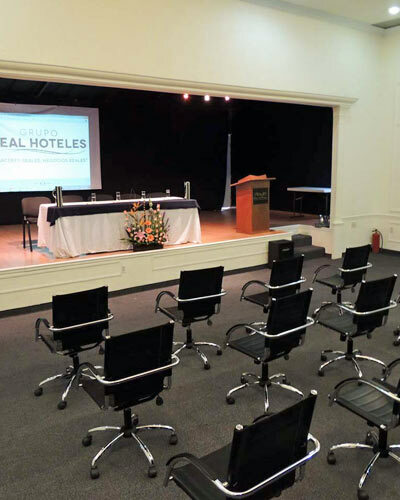 Real del Bosque Hotel welcomes your event guests. Our event specialists will gladly help you coordinate the details of their stay. We can help you arrange convenient and stylish transportation within the city and beyond.